For our video project we chose to cover the Holiday Market that was held in the Union. The event is held every year in December and gets bigger with every year. It consists of multiple different vendors from in state and out of state that come to Laramie to sell their products. There was everything from soaps to homemade dog treats at the market, it was a great opportunity to buy Christmas gifts for family and friends. We just shot video on our cell phones and got a few interviews with the vendors that were working there. Before we started filming we just wandered around, checked everything out and got a feel of the event. I really enjoyed actually being at the market and talking with the vendors there. Everyone we got interviews with were very nice and happy to talk to us. I had never heard of the Holiday Market before we decided to cover it for this project, which surprised me. Some of the things I didn’t like was the actual editing and when people refused interviews. I definitely prefer shooting and conversing with people to editing the video. The other thing that bothered me was when people refused to give an interview. Some people came off as very rude, but I understand that it is part of the job to get denied interviews. I found out that people are much more willing to do interviews that don’t involve being on camera. I was surprised by how willing some people were to do interviews, and by how unwilling others were. I found out there are some people that are very wary of doing on camera interviews. I wish we could have gotten more engaging interviews. But it is hard to judge who is going to give good interviews and who is not going to be engaging. Because the focus of my major is PR, I have found out that jobs within public relations involve a lot of multimedia. Video skills are essential to a lot of jobs where you are adding and managing media for a company. I can definitely see myself needing to know the basics of how to shoot and edit video. This assignment was a very good start and good practice for me. I was unfamiliar with twitter before I learned about this assignment. But, when I heard we would be live tweeting earlier in the semester, I downloaded the application for twitter on my iPhone. It was pretty easy to get the hang of, mostly because I have already been using other forms of social media for a while. I am pretty glad that I did start playing with the app early on because I started following people that would live tweet things going on around them. This definitely helped me wit this assignment. For this assignment, I chose to live tweet the “open mic” night at the Gardens on Thursday, December 4. I thought this would be a good event because there is a lot of changing of artists throughout the night and they usually have various types of acts, whether they are musical, comedic or something else. I also chose open mic night because the Gardens is a relatively small area and it would be easy to get interviews with the performers. I enjoyed a few things about the assignment. For one, I found it easier to live tweet rather than trying to write a feature story, which I have done in the past. Typing under 140 characters ten times was easier than sitting with a notebook and trying to record everything. I also just enjoyed the performers and the atmosphere at the Gardens that night. One of the things I didn’t like about this assignment was that I felt distanced from the actual performance because I had my phone out the whole time. This was probably because I am the guy that usually judges people who always have their phone in front of their face. One thing I learned is that it was strange asking people for an interview when you only need under 140 characters. I would just ask them questions where I would receive shorter answers, which was different than conducting a longer interview. Some of the people were surprised by how short my interviews were. One of the things I wished I would have done was get the set list of who was performing. If I would have done this I could have better introduced the performers before they actually started performing. I can definitely see myself continuing to use social media in the future. In terms of using it in my career, I will have to find out what my career will be first. If I go into journalism, social media would be a good way to give small bits of information about stories I am covering or stories that are breaking. No matter what I end up doing, social media will be a big part of most professions. This assignment definitely got me comfortable with using Twitter in a more professional manor, which will be helpful in the future. The audio experience for me was a little harder than I expected. I thought it would be easier because I had experience with video editing software from when I was in high school, but audio editing proved to be a little harder than video editing. With video editing, it is easier to keep track where you are because of the visual aid. But with audio editing, its just the audio and that makes it hard to see exactly where you are on a track. I did enjoy the editing because it did take me back to editing video. Once you get a program like Audacity or Final Cut Pro figured out, it can become pretty fun. However, I have not gotten used to Audacity and it was hard for me to remember where everything was located in the program. I was surprised because it was not more similar to video editing that I have done in the past. Before this blog I would have thought editing audio would be the same, but it proved much more difficult for me. I do wish I would have paid more attention while doing the actual interview. There were a lot of things I did not think of until I got to the editing stage. I wish I would have chosen a more quiet place to conduct the interview, because there were a lot of echoing and background noises that made it difficult to amplify the track. Also, I wish I would have spoke and laughed less during the interview. I was always responding to Broklynn’s answers, either verbally or just laughing. That made it very hard to edit space around her answers. And lastly, I wish I would have spent more time playing with the features on Audacity to make my track flow more smoothly. Overall, it was a great learning experience. I can take away a lot of things from this experience the next time I interview someone or edit audio. My interviewing experience went pretty well overall. Brooklynn, who I interviewed, and I were pretty comfortable with each other because we have talked in class before. Even though we knew each other, having an audio recorder in the room changed the dynamics of how we interacted with each other. I think we both changed the way we spoke when we were recording, it was not conversational language. Conducting the interview did not bother me at all, mostly because I was in control of the situation. However, when I was interviewed I was a little bit nervous because I did not know if my responses would sound good and would be the right answer that Brooklynn was looking for. I did enjoy hearing the responses to some of my questions. Some of her responses would turn into interesting and funny stories. It was when I got responses like those that I would almost forget that I was recording audio. Even getting interviewed was a little fun because I had to explain some things that I don’t usually talk to other about. But, I was nervous when I was being recorded and I think I would have answered questions differently had I not known I was being recorded. There are a few things I wish I would have done differently. We conducted our interviews in a hall way of the biology science building because there was no one there. This actually turned out bad because of echoing noises. So I wish we would have done the interviews in a small room or something similar. Also, I wish that I could have came up with more on the spot questions that I had not planned. If I would have been able to do that, we could have gone more in depth into different stories rather than staying with the more general questions that I had prepared. 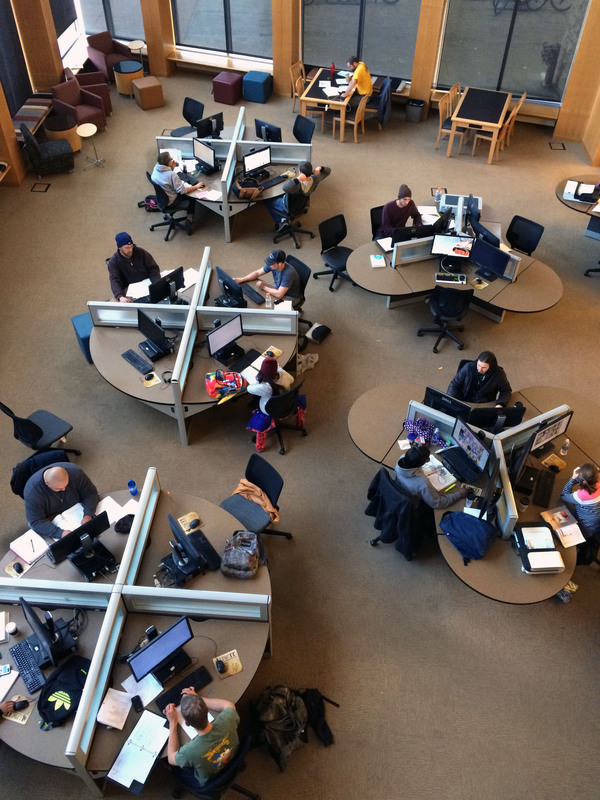 Students hard at work in Coe Library on the University of Wyoming campus. Photo taken on Monday, October 13. This picture is titled “Work.” This photo is of students hard at work in Coe Library on the University of Wyoming campus, taken on Monday, October 13. I took this photo while I was leaving the library. I noticed the cool point of view of looking down on the crowd of students using computers and took the shot. I had a connection to the students because we were all at the library, all working hard at our classes. It was a fairly easy shot to get, I simply leaned over the railing a little bit and snapped away. I used the creative device of viewpoint because I was looking down on the students from above. Nathan Fuller and Tyler Kybartas play a one on one basketball game early on Thursday morning, October 16, in the Half Acre Gym. 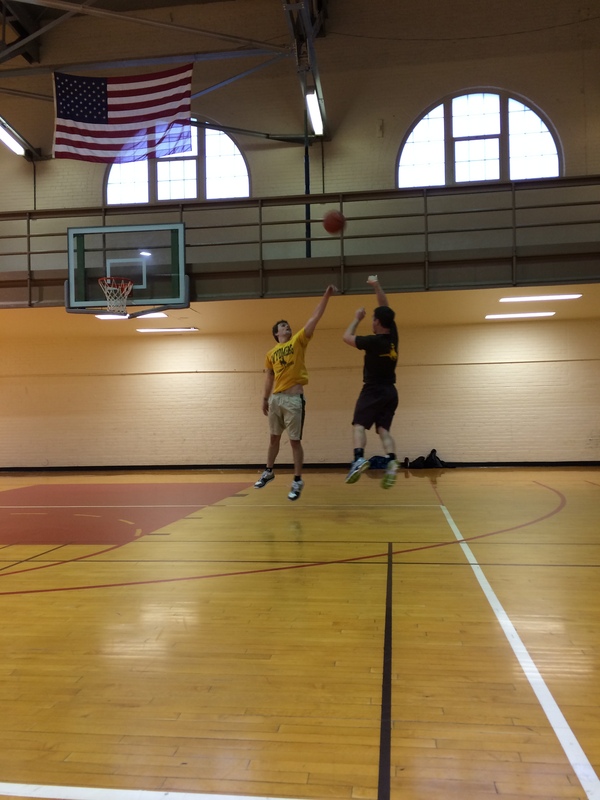 This photo is titled “One on One.” It is a shot of two students, Nathan Fuller and Tyler Kybartas playing a one on one game of basketball. It was taken early Thursday morning on October 16 in Half Acre Gym. I took this photo after working out, I just wandered up into the gymnasium part of Half Acre and asked the students if I could shoot some pictures. It was early in the morning and everyone was tired, but still pushing themselves to start the day. It was hard to get an action shot like the one I got, but I did get a few of them. I used the creative device of focus in this photo. The focus is on the two students jumping up in the air, while the ball is out of focus and still moving. People gathered at The Gardens in the basement of the University of Wyoming Union on a Friday afternoon to work, play or both. 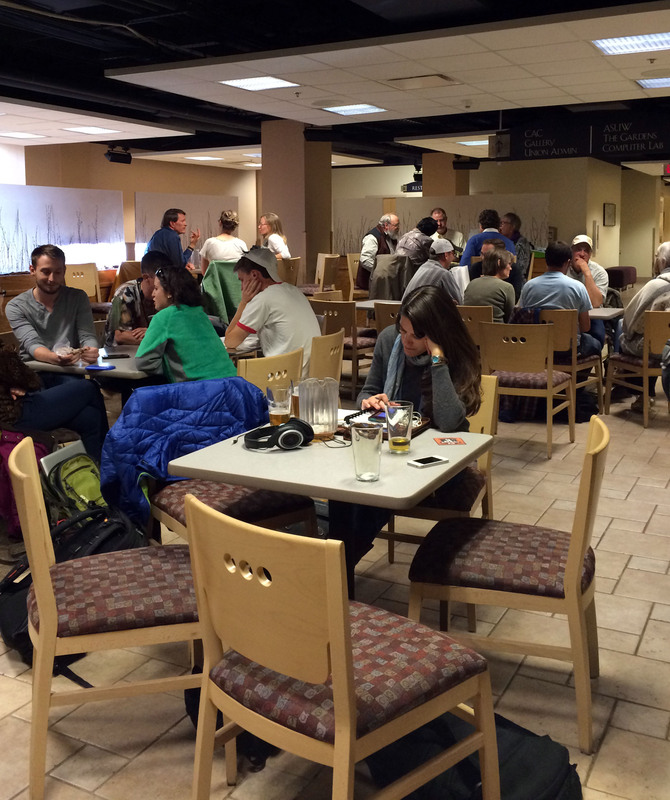 This photo is titled “Busy.” It is a shot of People gathered at The Gardens in the basement of the University of Wyoming Union on a Friday afternoon to work, play or both. I took this photo while I was meeting a friend at The Gardens one afternoon. I noticed how there were some people working on school material, and also people just leisurely drinking with friends. I felt comfortable in the mix of people there. I didn’t have a creative device in mind, but I feel like framing is a relevant device. The way the woman in the front of the picture is sitting at the table all alone, with the empty chairs surrounding her puts her as the focus of the photo. Unfortunately, the women left before I could get her name. 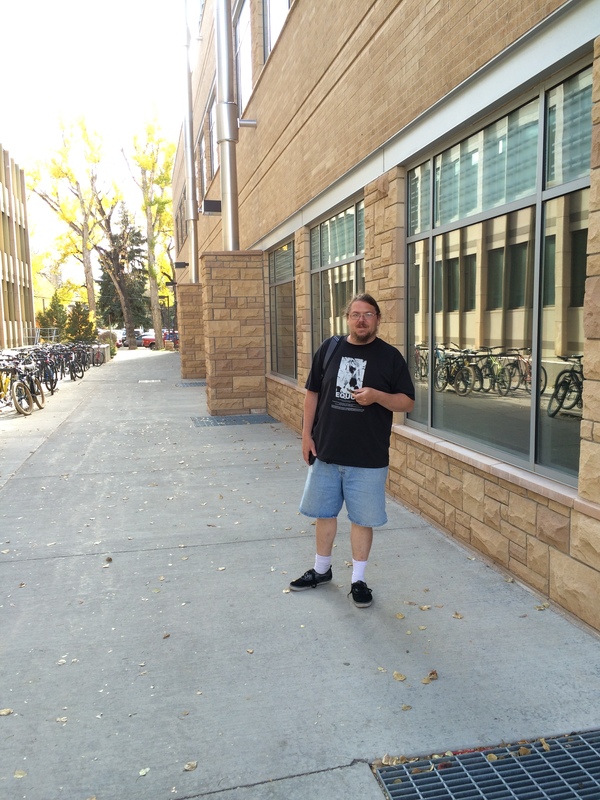 Student Chris Stratton takes a break from studying to smoke his vaporizer outside of Coe Library on October 16, 2014. This photo is titled “Vaping.” A student, Chris Stratton, takes a break from studying to smoke his vaporizer outside of Coe Library on October 16, 2014. I saw Chris standing there enjoying his vaporizer pen, and I asked to take his photo. We actually talked for about ten minutes after I took the photo and he was a very nice guy. It was very easy to get the shot, I did not get any low angles or anything like that. I used the creative device of rule of thirds, so that the viewers eyes are drawn to Chris because the sidewalk in between the buildings are empty. 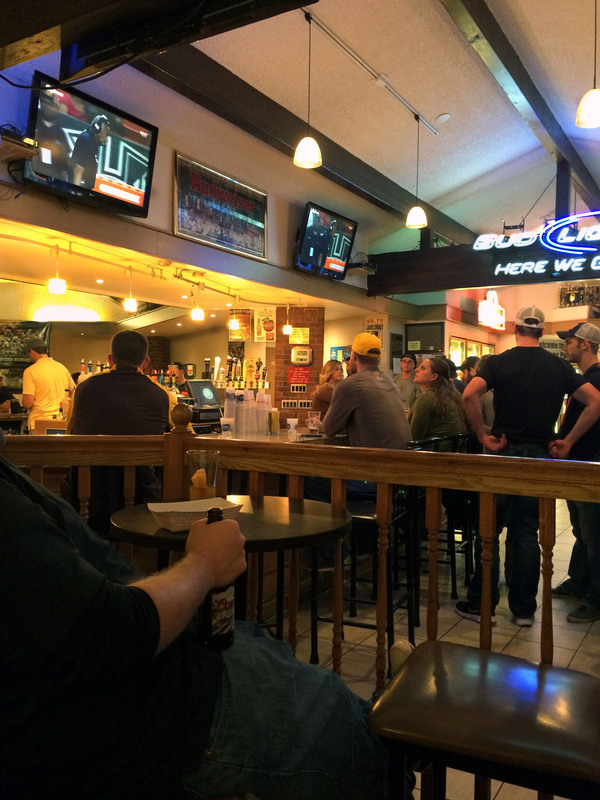 A crowd of bar patrons gather around to watch the University of Wyoming football game on Saturday, October 11, 2014. This photo is titled “Hawaii Away.” It is a crowd of bar patrons gathered around TVs at Mulligans Pub to watch the University of Wyoming football game on Saturday, October 11, 2014. I was also at the bar to watch the UW-Hawaii football game when I decided to take this photo. There was a sense of community that night, everyone was there rooting for University of Wyoming ad everyone was having very loud reactions to the game. It is a good feeling to be among fellow fans that are rooting for your team. It was easy to get this shot because I just took it while I was sitting at the table. I used the creative device of balancing elements because there is the crowd of people on the right side of the photo and the TV and bar on the left side of the photo and they balance each other out. This assignment did surprise me actually. I was surprised by how willing people are to let you take their photo. If I could do something different about the assignment, I would have engaged more random people to photograph because they always were interesting to talk to. This dominant creative device used in this photo is lighting contrast. Positioning the camera where the dog’s body blocks out the sun gave it this effect and draws the viewers eyes to the focal point of the picture. This photo also used the creative device of background. 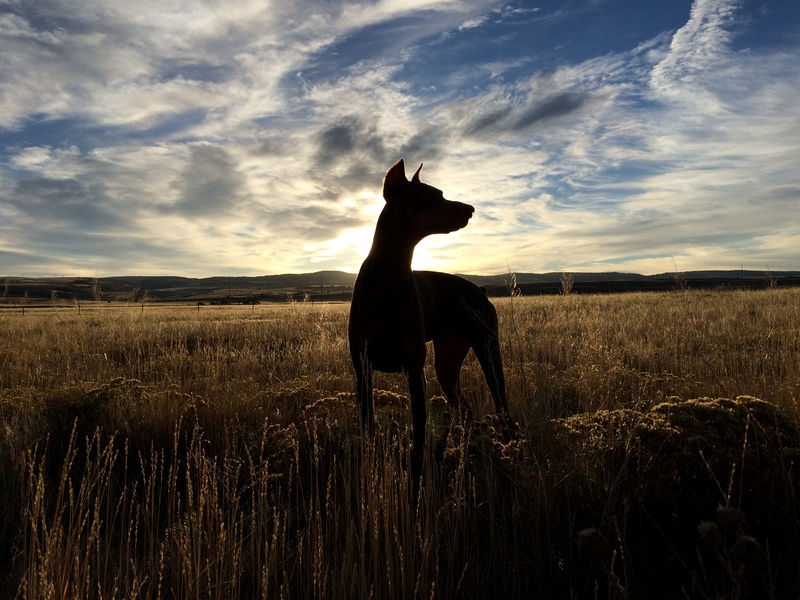 The morning sky in the background of the photo makes the focal point stick out to the viewer. The main creative device I used in this photo is focus. 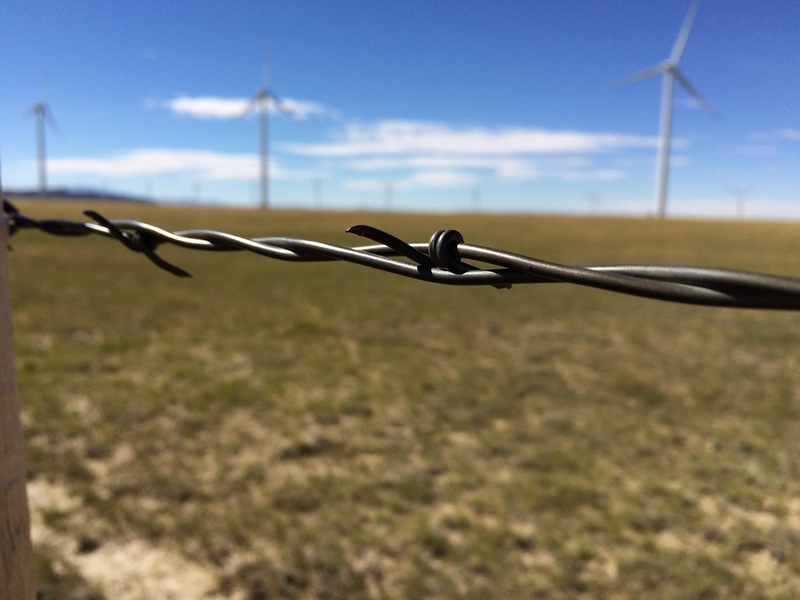 The eyes are drawn to the barbed wire because it is in focus, but wind turbines can also be seen out of focus. Another creative device that was used is viewpoint. I utilized this by squatting down and getting right next to the barbed wire. This gives a good perspective, looking up at the wind turbines in the distance. The main creative device used in this photo is framing. 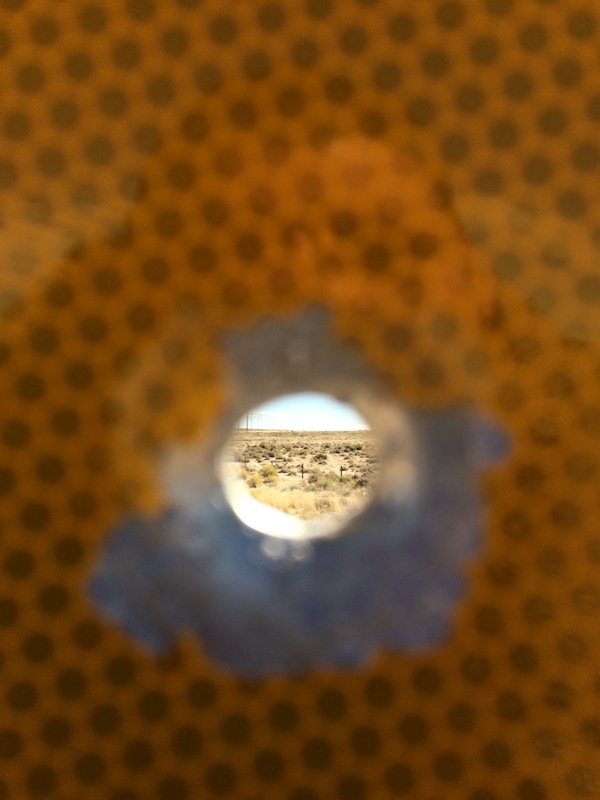 I did this by getting a picture of the prairie through a bullet hole in a highway sign. I also used the creative device of focus in this picture. I focused on the prairie in the background of the photo instead of focusing on the sign with the bullet hole in it. The main creative device I used in this photo was viewpoint. To do this I got below, and up close to my friends dog. 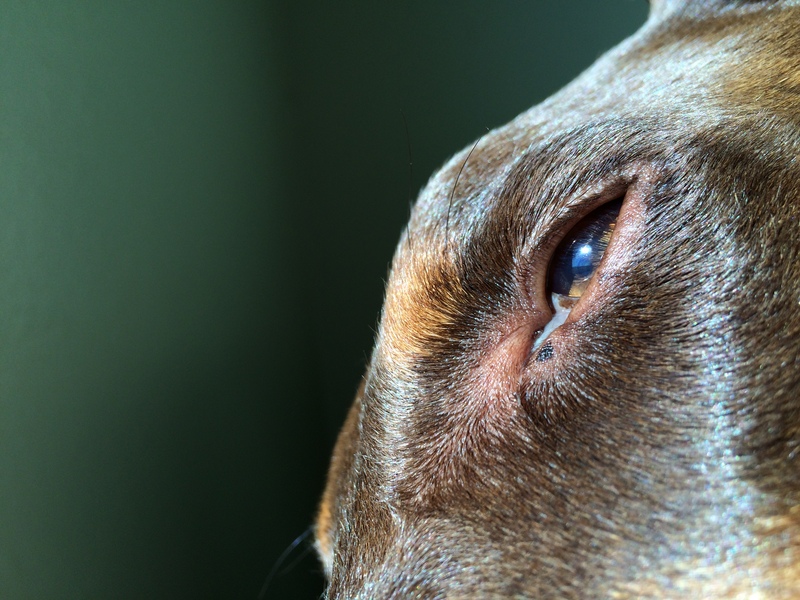 This makes the dog’s eye the main focal point. That viewpoint, along with the lighting makes it aesthetically pleasing. Another creative device that was used was focus. I focused the camera up close on the dog and the background is blurred. The rule of thirds is also a creative device used in this photo. There is focus in the two thirds of the photo and the third on the left side of the photo is blurred out. The main creative device used in this photo is leading lines. The lines of the side of the road, as well as the painted lines in the road draw the viewers eyes. 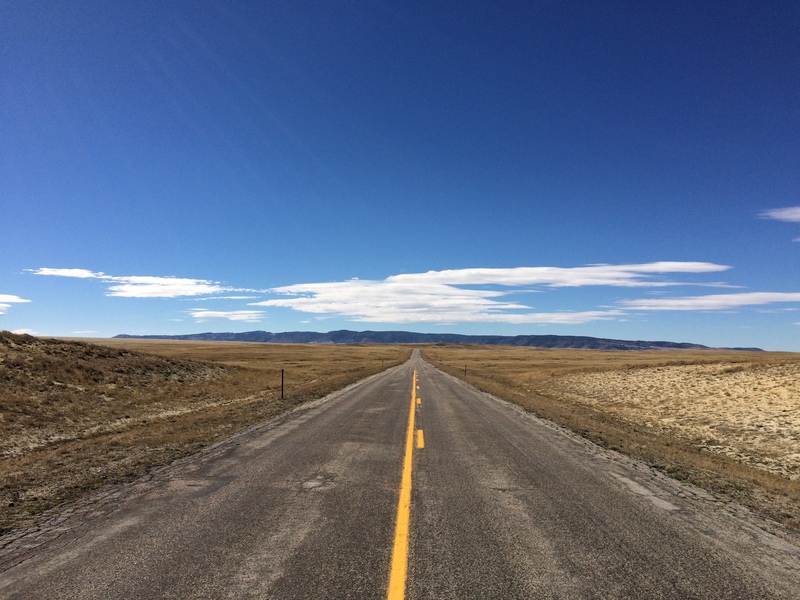 The lines of the road can be followed by the viewer all the way to the background of the photo. Another creative device used is symmetry, the lines of the road also make the photo very symmetrical. This assignment did surprise me somewhat. I was surprised by how the quality of photographs can be improved so much by using the creative devices that we have learned. I wish I would have tried to incorporate more creative devices all into a single photo, because photos with multiple creative devices turn out very cool. People began to trickle into Laramie’s skatepark around 9 a.m. for a Learn to Skate Session, held by the local group Friends of the Laramie Skatepark. Loner skateboards, extra pads and even doughnuts were all presented for any skaters who want to learn to skate, or improve their skateboarding skills. The event was held on Saturday, Sept. 20. and was the fourth one that the group has organized this summer. There are a couple goals that the Learn to Skate Sessions are meant to accomplish. It seemed to be working, as most of the younger skaters in attendance were coupled up with an older counterpart that was giving them pointers. Parents also stood by cheering their children on or talking with some of the older instructors. The kids in attendance were bringing a wide variety of skill sets to the park that morning. Some were learning how to “drop in” to the concrete bowl, while other kids were learning the basics of being able to go on a skateboard. Either way, the older skaters that were acting as instructors were more than happy to help assist them. Kaffer was teaching one of the younger kids, Sean, how kick while on the skateboard while his mother watched from the grass. “This is our first time skating, so I just tell him to try and not fall down” said Sean’s mother. 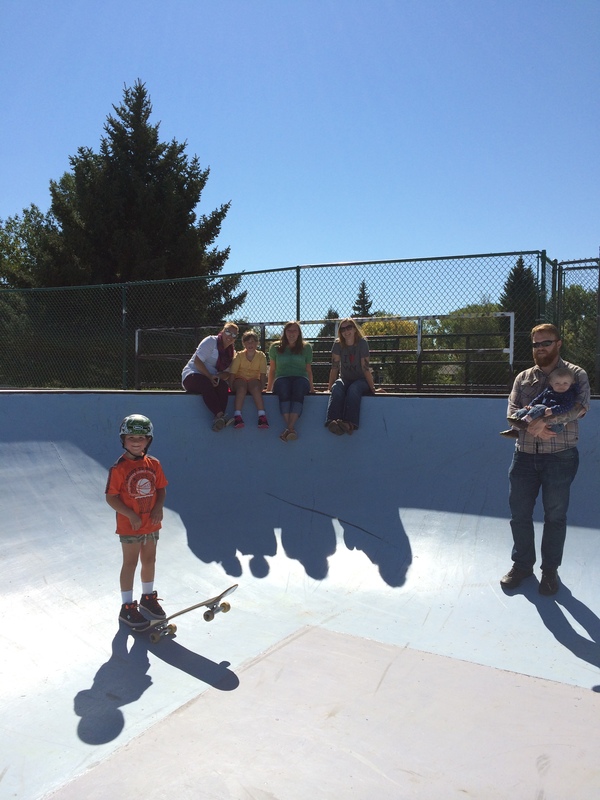 Friends of the Laramie Skatepark is an organization that was started in the spring of 2014. It was organized by Kaffer and other local skaters in the area who did not like where things were headed with their park. Issues about mismanagement were at the forefront of their concerns. Before Friends of the Laramie Skatepark began to make improvements, the park looked very different. The concrete was covered in graffiti, the rails that go around the concrete bowl were often rusted over and the park was a known hang out for trouble makers. Kaffer began to attend board meetings for Laramie’s Park and Recreation Department and would inquire about improving the park and present goals for them to reach. Today, the park looks very different. All the graffiti has been painted over, the rails are all in good shape and most loiterers are asked to leave the park if they do not intend to skate. Another organizer of Friends of the Laramie Skatepark, Conor Mullen, explained what their mission was. It seemed that Friends of the Laramie Skatepark has accomplished their mission. 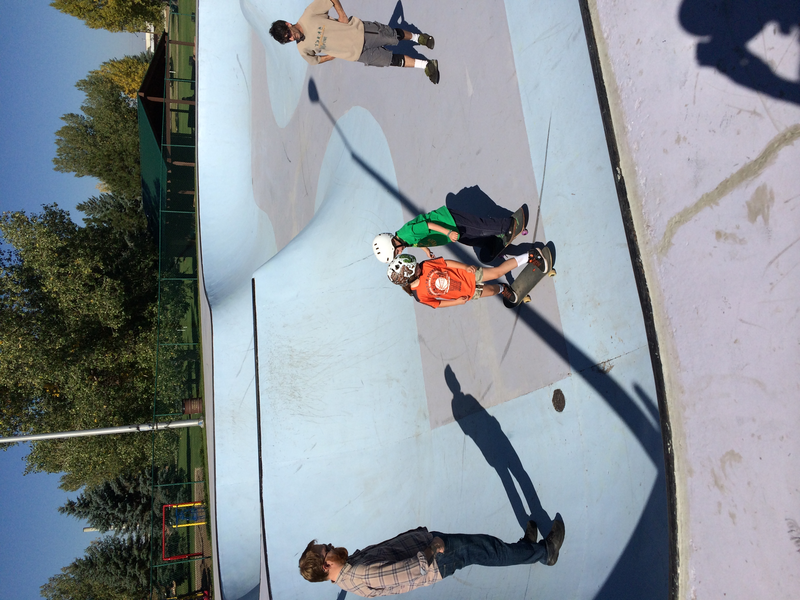 That Saturday morning was a good example of the potential a well-kept skatepark has in Laramie. The Learn to Skate Sessions have been growing since their first event that was held in June 2014. The people in attendance had heard of the event either by following the organization’s Facebook page, or word of mouth. Kaffer seemed to be content with the turnout, and had a seemed to have a sense of pride when explain the Learn to Skate Session. Their mission seems to be working. Most of the younger kids that hang out at the park regularly are starting to enforce the rules of Friends of the Laramie Skatepark. They clean up broken glass, don’t let anyone spray paint in the park and enforce the no loitering rule. “Really what we are trying to do is use skateboarding and the skatepark as a platform for building community” said Mullen. The skatepark is becoming exactly how the organization is envisioning it.